Arnold Schwarzenegger in The Last Action Hero could pull off that line. Holbrook, tailspinning after one of the least satisfying third-act throwdowns in Predator franchise history doesn’t quite have the pizazz for it. What doesn’t help is that the “suit” he’s referring to is the unspoken MacGuffin of the movie, an alien design revealed in a final scene that plays just like a Marvel Cinematic Universe post-credits scene… without an entire list of production caterers and track listings running before it. The moment is baffling, but once you see it, it’s also bittersweet: if only Black had scrapped the previous two hours of mythology-laced rebooting and made that movie. And based on early footage and pre-production talk, it sounds like he wanted to. The Predator ends with a victory. Though all of his military comrades are dead, McKenna and scientist-turned-Black-Ops-assassin Casey Bracket (Olivia Munn) succeed in downing the Predator spacecraft, rescuing McKenna’s son Rory (Jacob Tremblay — the next step in child actor evolution), and slaying the Super Predator. There’s just one burning question left: what was the human-alien hybrid, ripped apart by the Super Predator halfway through the movie, trying to deliver to the Earthlings? Though the blink-and-you-miss-it, death-by-shoulder-cannon-blunder Will Traeger (Sterling K. Brown) could have been the end of McKenna’s relationship with Big Government, the military loops him into future anti-Predator warfare plans after he defeats the Super Predator, and reveals to him exactly what he’s been fighting for this whole time. Stashed away in an escape pod is the Iron Man Mark III armor of Predator World, somewhat sentient, but in need of a foul-mouthed, ball-bustin’ Action Movie Guy to take the wheel. The existence of the Predator Killer suit surprises the elite scientists, the poor schmuck attacked by the Symbiote-like armor, and Rory, who is now an employee for the government (?!) because his autism allowed him to decode and operate Predator technology (?!?!). 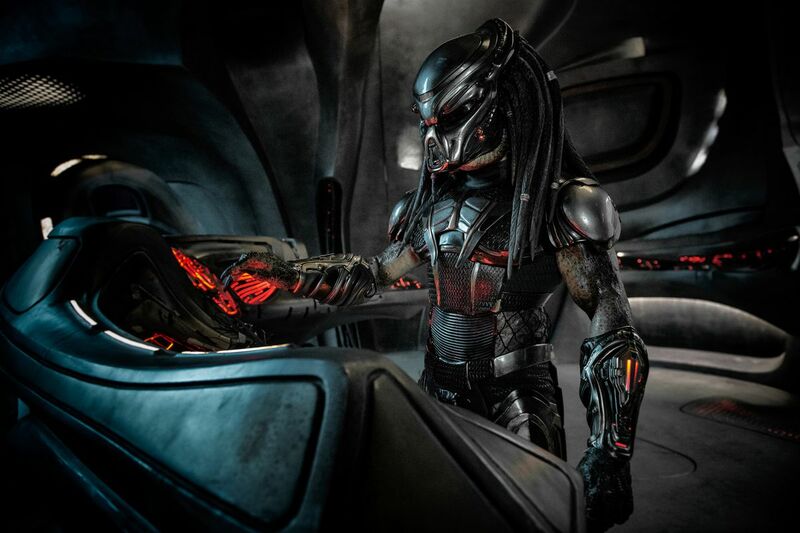 The Predator Killer suit doesn’t faze McKenna, who immediately imagines strapping into the ballistic war machine, flying out to space, and uncloaking Predators through the art of mandible-ripping. With the movie sitting at a 35% on Rotten Tomatoes as of publication, box-office predictions looking satisfactory at best, and controversy about Black’s casting decisions marring the publicity of the film, we may not get the movie where an armored McKenna busts up alien warriors, but The Predator can dream. Six movies in, it seems clear that The Predator wasn’t built to be a franchise. The original 1987 movie was a First Blood-adjacent men-on-a-mission movie that subverts the action by running alien interference. Predator 2 couldn’t figure out what to do next, so we got a Danny Glover-led L.A. romp and the ultimate high — an Easter egg implying the Alien Xenomorphs existed in the same universe — that sent imaginations spinning for 30 years. The Alien vs. Predator duds, plus the stylish-yet-ineffective throwback Predators, addressed those fan desires, but couldn’t draw blockbuster crowds to the movie. How could a character design this sleek, this influential have his much trouble growing into a tentpole-worthy IP? The disbelief is why we have The Predator (and perhaps why we’ll one day have a Boba Fett movie). The odds were against The Predator, but Black was on to something with his stab at sequel greatness, and the faux post-credits scene may have been the movie he actually wanted to make all along. Around the time the trailer for his soon-to-be criminally underseen comedy noir The Nice Guys dropped in March 2016, Black told me that he got The Predator gig because 20th Century Fox knocked on his door. At first, he was reluctant. The idea of making “Predator but treat it like it was Iron Man III” was impossible to resist, and at that time, there were even talks that Schwarzenegger would return to the franchise. Everything sounded gold on paper. Sadly, the lone “good” Predator and his cargo, the anti-Predator suit, are the only remnants from this expanded vision. For the most part, The Predator is earthbound and tamed by the limits of human combat. Black was right: another man-vs-Predator skirmish isn’t enough to carry a movie, nor is flirting with the expansion of the mythology. In The Predator, the aliens are no longer hunting for sport: they’re actively picking off our brightest and boldest to harvest prime DNA before we’re wiped out by man-made disasters. And when climate change finally does humanity in, the Super Predators intend to live on our husk of a planet. Gnarly! And scrambled in the actual plot of The Predator, which limps on a crutch made of 30-year-old franchise tropes. The movie’s absurd, final scene — with hints of the intergalactic narrative that could have been — is where this movie needed to begin to rev the engines of a surface-level franchise. Just as Ridley Scott’s Alien: Covenant spun Prometheus and Alien lore in hair-raising, existential directions, The Predator needed to be a radical reinvention, not only to stand up to the gluttony of $200 million blockbusters warping the audience member’s expectations, but to raise the stakes of the initial idea. If a line like “Hope they got it in 42 long” is the only way to get there, so be it. There are too many movies for a sequel to deliver more of the same. In 2018, a great installment abandons a franchise’s “definition” and asks a new question to come as close as possible to something original. The Predator , anchored by the Predator Killer suit and whatever’s happening in the stars, could have been the next step in Hollywood IP-mining evolution — the Jacob Tremblay of sequels. Instead, it’s the last gasp of breath before the Predator series croaks.